Physical retail sales reached $1.176 billion (up 11 per cent) and overall digital sales hit $2.054 billion (up nine per cent). Home console hardware sales increased by 36 per cent in 2017, with the Nintendo Switch making a strong debut. Retro consoles such as the Nintendo Classic Mini: SNES and Nintendo Classic Mini: NES also performed well. Full digital game downloads were up 17 per cent on 2016 sales. Digital extras also increased 12 per cent year-on-year. Sydney, Australia – 22 February 2018 – Australians’ love for playing video and computer games continues to skyrocket, with consumers spending $3.23 billion in 2017 on games and hardware, a nine per cent lift on the previous year’s sales. 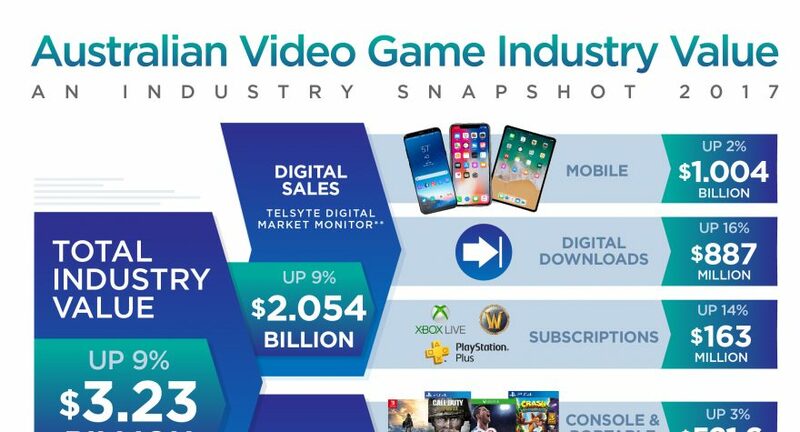 Data released today by the Interactive Games & Entertainment Association (IGEA) shows total physical retail sales reached $1.176 billion and overall digital sales hit $2.054 billion last year. According to data from The NPD Group Australia, overall physical retail sales increased by 11 per cent. A cyclical upturn and solid performance in retail sales driven by hardware such as the PlayStation®4 (PS4™), Xbox One and Nintendo Switch, resulted in console hardware, console accessories and console software all experiencing growth. Research from Telsyte indicates total digital sales were up nine per cent, surpassing the $2 billion mark in 2017. Digital downloads, including full game downloads and digital extras, increased by 16 per cent last year. Subscription revenue also continued to grow, up 14 per cent in 2017, with more gamers signing up to PlayStation®Plus and Xbox Live. Mobile game sales retained the majority share of the digital games market, and in 2017 generated more than $1 billion in revenue. 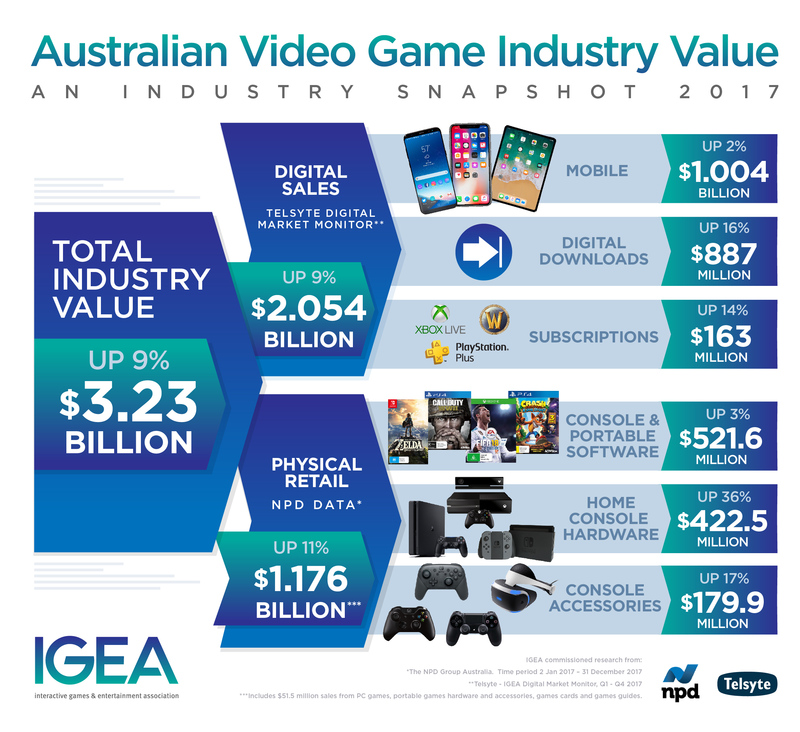 Since 2009, IGEA has provided a review of the state of Australia’s video games industry using commissioned research from The NPD Group Australia. With the growth of digital gaming, the NPD data has been augmented with research from Telsyte to provide a complete picture on the state of the industry. For interviews with Ron Curry, CEO of IGEA, please contact Amy Rathbone, Espresso Communications on +61 2 8016 2200 or igea@espressocomms.com.au. For interviews with Foad Fadaghi, Managing Director of Telsyte, please contact him on +61 414 992 466.